Motion has been shipping for several months now and there are several excellent Motion tutorial books on the market. These books teach by providing lessons and exercises along with video material to work with. A good way to learn Motion. 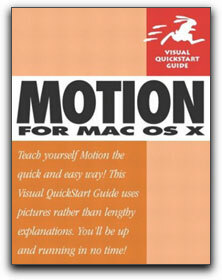 So with several good books out there why would one be interested in the Motion for Mac OS X: Visual Quickstart Guide? The main reason is that 'Motion: Visual Quickstart Guide' is as much a Reference book as a tutorial. For those of you unfamiliar with the Peachpit Press Visual Quickstart Guide format, it is a streamlined approach to teaching: each topic, each procedure is presented with the appropriate screen shots, and step by step instructions to perform the desired procedure. There are brief explanations of the process, Tips and sidebar information that add to the reader's understanding of the subject. Motion is a totally new application with many processes and workflows that are new to us, features like; Behaviors, Particles, Objects, Layers, Libraries, Mini-timelines, Dashboard controls and Real Time abilities, to name just a few. Because of this, 'Motion: Visual Quickstart Guide' has a very through introduction, a walk through of the interface, and very complete explanations of the many features of Motion. You can use the 'Motion: Visual Quickstart Guide' in two ways. If you are just starting off with Motion you can read the book from cover to cover, this will not only introduce you to Motion and the concepts of how it works, but to the methods used to achieve Motion graphics effects. Once you have become acquainted with Motion you can use the book as a Reference guide to find ways to accomplish the effects you desire. The book has a very complete Index that you can use to look up any topic that you need help with. Motion is a new and exciting application which runs much deeper then it would at first appear. Mark Spencer has done an excellent job with this book, sorting out the different elements of Motion and presenting the information in a clean, efficient, and concise manner. It is obvious that he thoroughly knows Motion and has the ability to explain, in simple terms, Motions' more complex abilities. I admit to having Peachpit Visual Quickstart Guide books for all of the Apple Pro series applications and 'Motion: Visual Quickstart Guide' by Mark Spencer now sits at the top of the stack. For me, the reference nature of this book, the ability to look something up in the Index and then find a step by step lesson, is a powerful learning tool, one that I could not do without. You can purchase 'Motion for Mac OS X: Visual Quickstart Guide' from the lafcpug store.